We had the final UCOA meeting of the year this evening at Texas Mist. It was a short meeting. We are having a great December, we had two toy runs and the JW Rock food basket and toy deliver that all went wonderfully. 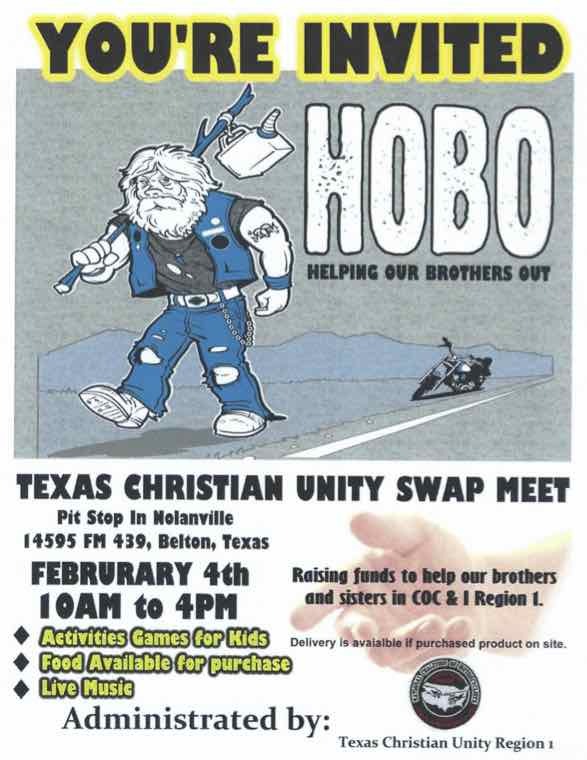 Our next meeting is the 2017 planning meting in January, and I announced the HOBO (Help Our Brothers Out) swap meet at the beginning of February (flyer below). Just a couple of pics this evening, and I hereby wish everyone a wonderful, blessed Merry Christmas and a happy new year for 2017. As we approach Christmas, the day that we celebrate the birth of Jesus, the Son of God, we see that Jesus birth was entrusted to a mere human woman named Mary. And, not only His birth, but his protection and his up-bringing through the fragile years of childhood as He grew into a Man. His parents, Mary and Joseph, had to trust God to provide for their safety and provision through all of those years. In the same way, we are entrusted to provide safety and provision for our children as they grow-up to be men or women. That responsibility can be a heavy weight at times, because it isn’t always easy to provide security and put food on the table. This was made especially evident as we met our JW Rock families, it was obvious that they desire to provide for the needs of their children as best they can. Mary and Joseph were in a tough spot, and God provided. The inn keeper provided a humble place to stay, and the wise men brought gifts. Last Sunday, we each provided what we could so that the families could experience the joy of Christmas. And we experienced the joy of giving. Your life is totally and completely surrounded by Him, and you can have confidence that His plan being worked out in your life. “My peace I give to you”; it is a peace that fills you all over from the top of your head to the bottom of your feet, an everlasting confidence. “Your life is hidden with Christ in God.” and the unstoppable peace of Jesus Christ completely fills you. Whatever difficulties or trials you may encounter, you can be confident that God WILL work everything out. He loves you so much that he gave His only Son so that you might have life, and have it in abundance. I have life in abundance, how about you? If you are not sure, come talk to me or one of the other chaplains. We met at Texas Mist this freezing cold morning to assemble and distribute the JW Rock food baskets. Everyone showed up though, despite the cold. We arrived at the family’s home about 11:30 and as you can see there was a bunch of us. They greeted us with home made cookies and hot chocolate. There was lots of sitting on bikes, hugging, talking, laughing and picture taking. They were very appreciative. They are an awesome family and we were blessed to meet them. The birthday party for Bandido Tattoo was this evening at Spinner, so Debbie and i went over early for dinner and then hung around to talk with our friends from the clubs. Eventually we found Bandido Tattoo and wished him a happy birthday. It seems like our chat with friends was mostly about the JW Rock delivery Sunday that could apparently be in weather down to the mid teens in temperature. I sure hope everyone dresses warmly, cause we don’t need any frozen fingers or other body parts. We want everyone to have a good time. We are certainly looking forward to it. After leaving the party, we headed home, and drove around the neighborhood for a few minutes looking at Christmas lights. I’ve include a few shots of them for your enjoyment. Oh, and the last shot is our house. I think my tree is tilted a bit, I’ll have to fix that tomorrow. Our Christian unity meeting was this evening, and we had a lighter crowd than usual, but we were plenty lively. Mostly we talked about the Legislative day in january, and our HOBO (Help Our Brothers Out) swap meet in Early February. Details to come.